We’ve added two (or one-and-half?) new bikes to our fleet since May, but I haven’t talked about them much here. Time to change that! The Kona Dew Deluxe that I purchased in early May is my primary bike these days. While I was excited to have finally made a decision, I was concerned about ride comfort with the aluminum frame on bumpy city roads. I also experienced some knee pain after my first few rides (despite having the bike fitted) that brought a few twinges of buyer’s regret. I’m happy to report that the ride quality is just fine, and my knee pain seems to have resolved (maybe I just needed to get used to the position?). The nine gears (only a single ring in front) work well for most of the riding I’m doing, though I’m not sure I could get it up a steep hill pulling a loaded trailer without a lower gear. While it seems like a nice addition to a commuter bike, I don’t use the front basket all that much. 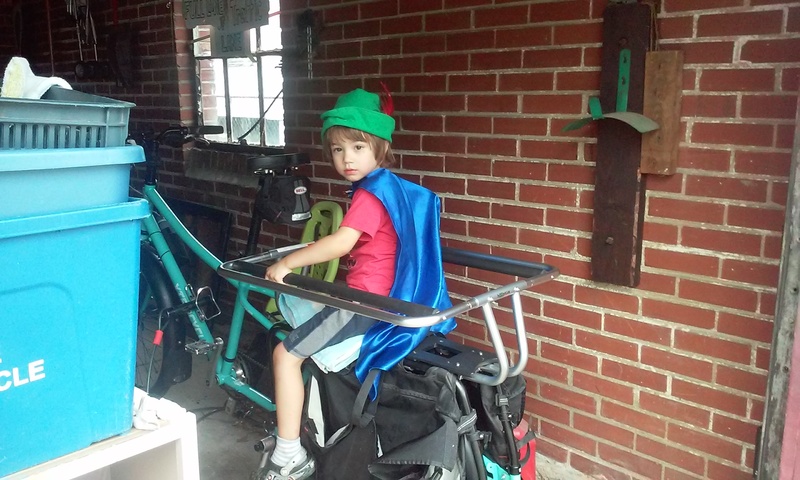 Putting any kind of weight up there changes the bike’s handling significantly (trickier than riding with G in front of me in the IBert), so I usually leave it empty, or reserve it for bulky but light items, like our picnic quilt. I wasn’t really set on naming this bike, but “Midnight” popped into my head a few weeks ago, and it stuck. I’ve been spending a lot of time on Midnight lately (#30daysofbiking post coming up next week), and I’m very glad that I’m not riding BUB for my 15-mile RT school commutes. 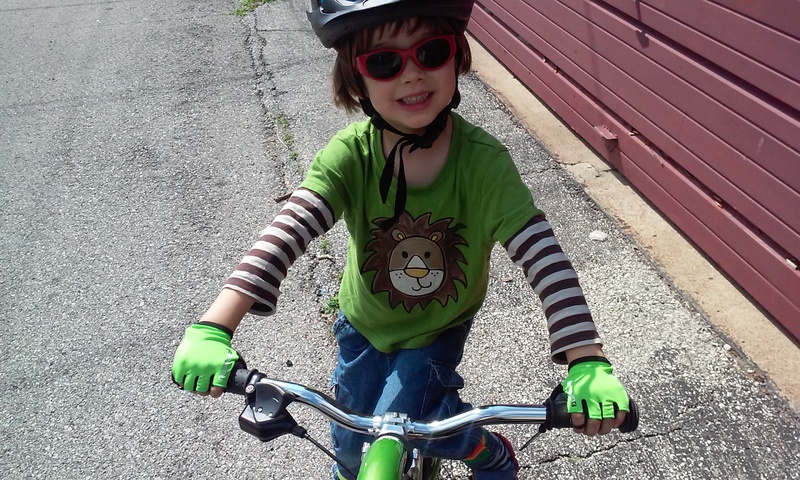 We’ve been enjoying our Burley Piccolo [trail-a-bike], recently christened “Apple Jack” by Gabriel, since mid-May. 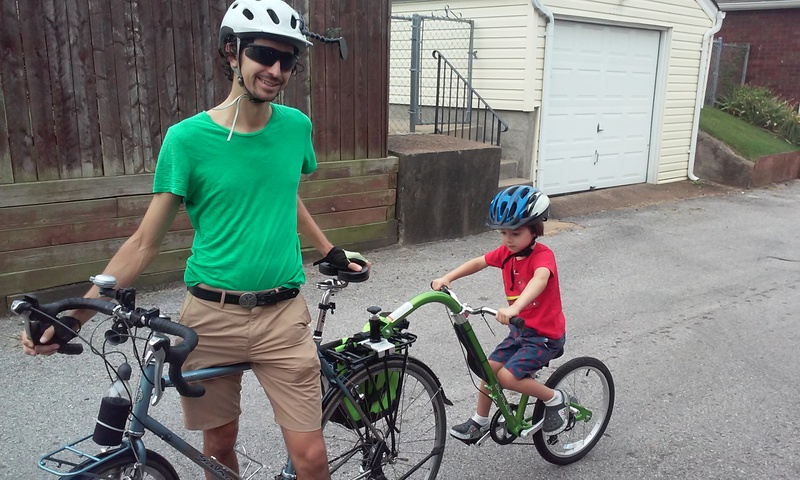 We started out with short jaunts, but by the end of May, Matthew and Gabriel completed the 4-mile ride to G’s preschool. It is now our child bicycle conveyance of choice for shorter trips. On longer trips where we really want to move and plan on spending significant time on larger roads, we still turn to Big Blue, though we’ll eventually use Apple Jack for these trips too. 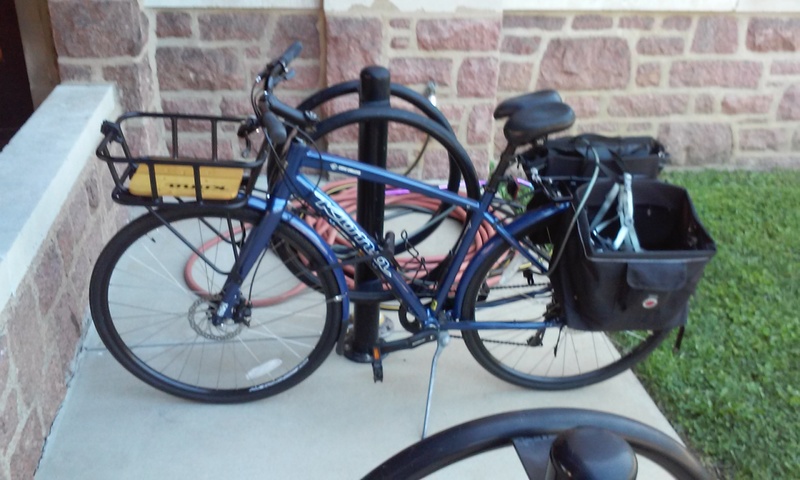 Matthew and I each have a bike with the Burley Moose rack (propriety rear rack to which the Piccolo attaches) mounted. I use Midnight and Matthew uses his road bike. Installing the racks was no easy task; it left us wishing we’d left it to the bike shop, where the installation probably would have been included with our purchase. Live and learn, I guess! While he’s still pretty hesitant about riding independently, Gabriel loves pedaling along on Apple Jack and being part of the “bike team.” I’m looking at this picture and realizing that we still need to get a fender for Apple Jack! Between me finally getting a new bike (I had been using Big Blue for many solo trips, just because it’s a much nicer bike than BUB) and the addition of the trail-a-bike, Big Blue didn’t see much action for a couple of months. We took her into the shop for a tune-up at the end of May, and then didn’t use her until July 4th. A week or two after that, while installing our new Hooptie, I noticed an oily puddle under the rear tire that lined up with the internal hub. Instead of hauling the entire bike into the shop, I decided to remove the rear wheel, which turned out to be no simple feat with the internal hub, but with the help of YouTube videos, Matthew prevailed. The diagnosis was a missing o-ring (that was not replaced when the hub was serviced in May). With some new transmission oil and the o-ring back in place, we were in business, just in time for my family’s visit, when I was planning for all of us (5 adults and 2 kids — we had just enough bikes for everyone) to ride together. Alas, that ride would have taken place the morning after G broke his leg, so it never happened. It was nice that the longtail was fully functional, because Gabriel was in no condition to be riding a bike for a few weeks there, so we reverted to Big Blue while Apple Jack collected dust. Getting him onto the bike was easier than getting him into the car. I removed half of the Hooptie and put his Yepp seat back on for the time being (the Yepp seat fits works with the full Hooptie, but this made it easier for me to lift him into place when his leg was still hurting a lot. I think G is now at a point where we could ditch the Yepp seat and just let him ride on the rear deck with the full Hooptie in place. I still need to make some seat pads (planning to use garden kneeling pads and heavy duty velcro to secure them to the deck. We’re still waiting on the back-ordered U-tube footrests from Xtracycle, but for now he can stick his legs into the bags. 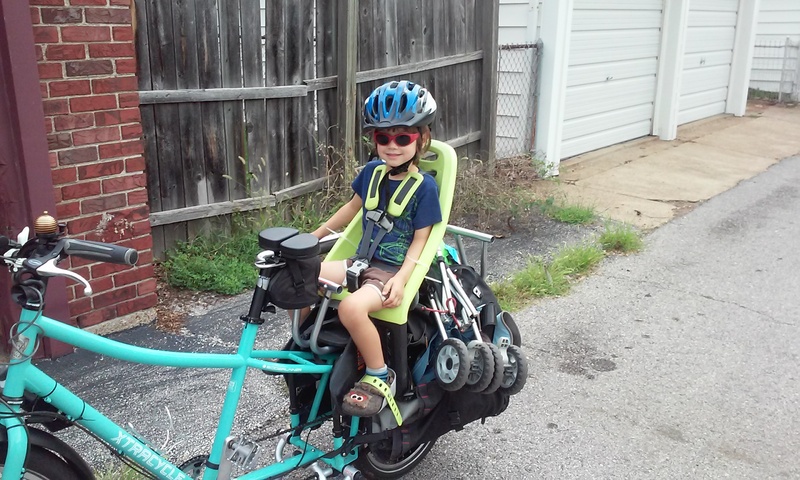 This entry was posted in Biking and tagged bicycle love, biking with kids. Bookmark the permalink.